February 8, 2011 - UPS on Monday announced grants totaling $7 million to more than 80 non-profit organizations whose mission is to support diverse populations. These grants will fund programs that develop leadership skills, promote education and encourage inclusion of all individuals. The Human Rights Campaign to support the HRC Foundation's Workplace Project, a program that encourages fair workplace inclusion practices through benefits, diversity programs and recruitment practices. The National Council of La Raza to support the continued expansion of its regional Affiliate Network, a diverse network of community based organizations that support the needs of Hispanic Americans. The National Urban League to support infrastructure and the NUL's Entrepreneurship Centers. This grant further strengthens the partnership between the National Urban League and UPS, which resulted in the hiring of the first African-American UPS driver in 1957 and the development and support of future business leaders through the Black Executive Exchange Program. The NAACP in support of its Afro-Academic, Cultural, Technological and Scientific Olympics (ACT-SO) program, a year-long achievement program designed to recruit, stimulate and encourage high academic and cultural achievement among African-American high school students. The NAACP also will use the grant to support their National Conference and the Spingarn Dinner. The Alexander Graham Bell Association for the Deaf and Hard of Hearing to support web site development and implementation of the 'Knowledge Library,' which will help educators nationwide meet the academic needs of children who are deaf or hard of hearing as well as provide resources for their families. The Paralyzed Veterans of America to support its Vocational Rehab program and the 2011 National Veterans Wheelchair Games. The National Federation of the Blind to support educational programs for blind youth in science and Braille literacy. Girls, Inc. to support the Leadership and Community Action Program. "UPS's commitment to developing women and minorities is a pledge that extends beyond philanthropy and into UPS's approach to business," said Eduardo Martinez, director of philanthropy and corporate relations for The UPS Foundation. "We are pleased to support these organizations in pursuing their missions and goals as they work to positively impact citizens throughout our community with education and leadership development opportunities." 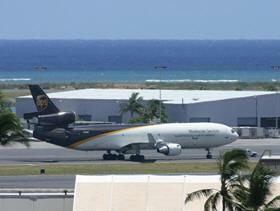 UPS's diversity program also is aimed at attracting and retaining talented employees. "UPS not only provides career opportunities to people of varying ethnicities, religions, ages, genders, mental and physical disabilities and sexual orientations, but also supports its workforce through targeted development programs like its Women's Leadership Development and Diversity Leadership Development initiatives," added Allen Hill, senior vice president of human resources for UPS. Since its founding in 1907, UPS has built a legacy as a caring and responsible corporate citizen, supporting programs that provide long-term solutions to community needs. Founded in 1951, The UPS Foundation, which celebrates its 60th anniversary in 2011, is responsible for facilitating employee involvement in the local, national and global communities. In 2010, UPS and its employees, active and retired, invested more than $95 million in charitable giving around the world.